AV-PAK series modules are steel chassis designed with aluminium extrusion, and have been designed for ‘rugged field use’, stage use, or permanent installation. These designs provide ground-Isolation in balanced and unbalanced line-level systems to remove ground or earth-loops, thus removing the main cause of hum. Suitable for portable use or permanent installation they are built in rugged metal cases and are supplied with mounting brackets. 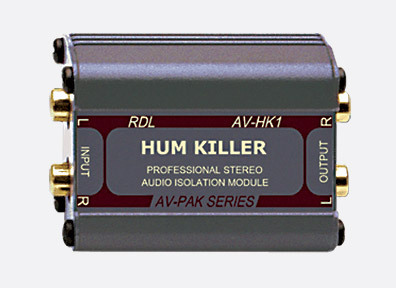 Both mono, balanced and stereo, unbalanced, transformer-isolated types are offered. For use with unbalanced, high-impedance audio inputs, this has gold-plated input and output connectors. 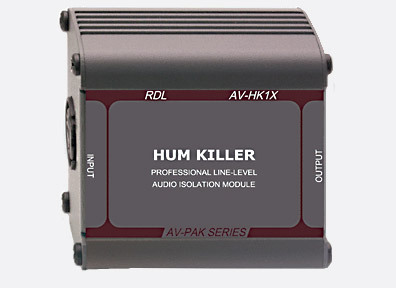 The AV-HK1 is supplied with two adapter cables to facilitate connecting with products that use miniature jack plugs and sockets. The shield connection of each input socket is electrically isolated from the case and from the output ground. The shield connection of each output socket is connected to the case shield. The user audio source, such as a computer, CD player, cassette player or other consumer audio product, connects to the input. The output should be connected to the input of the grounded amplifier or mixer in the audio system. Inputs: -10dBV nominal, 10kohms. Response: 20Hz-20kHz, +/- 3dB. Distortion: Better than 0.5% THD+N, 30Hz-20kHz; 0.05% at 1kHz. Crosstalk: Better than -60dB, 20Hz- 20kHz, 100ohms source, 10 kohms load; -70dB a 1kHz. Outputs: -10dBV nominal, 10kohms. Dimensions: 35 unmounted, 36.6 mounted x 52 x 73.7 (h x w x l) mm. Included accessories: Mounting bracket. AV-AC2 Cable Kit: 1x dual RCA (phono) to 3.5mm stereo jack plug, 200mm, and 1x dual RCA (phono) to 3.5mm stereo jack socket, 200mm. This is for use with a balanced, low impedance source and either a low or high impedance load. Input and output XLR connectors have gold-plated contacts. The shield or ground (pin 1) connection of the input socket is electrically isolated from the case and from the output ground (pin 1) at audio frequencies. The ground connection of the output socket is connected to the case shield. The user audio source, such as a mixer, preamplifier or other professional audio product, connects to the AV-HK1X input. The module output is to be connected to the input of the grounded amplifier or mixer in the audio system. The input connector shield does provide a radio-frequency ground return, thereby preserving system immunity to radio interference. Input: +4 dBu nominal. Response: 20Hz-50kHz, +/- 0.1dB. Distortion: Better than 0.15% THD+N, 20Hz- 20kHz, 150ohms source, 10kohms load; 0.002% at 1kHz. Output: +4 dBu nominal. Dimensions: 44.5 unmounted, 49.5 mounted x 73.7 x 82.6 (h x w x l) mm. This four-channel line level divider/combiner is able to combine multiple input sources into a single output, or divide a single mono audio source into up to three mono signals. All inputs are via balanced female 3-pin XLR sockets, whilst outputs use balanced male 3-pin XLR connections. Each of the modules four channels can be used as either input or output. Frequency response: 20H to 20kHz, +/- 0.05dB. Input: +4 dBu nominal. Output: +4dBu nominal. Noise: Less than 0.5%, 50Hz to 20kHz; 0.02%, 1kHz. Insertion loss: 1dB, nominal (one input, one output); 6dB nominal (two inputs, two outputs). Dimensions (h x w x l): 44.5 x 89.7 x 201.4mm. 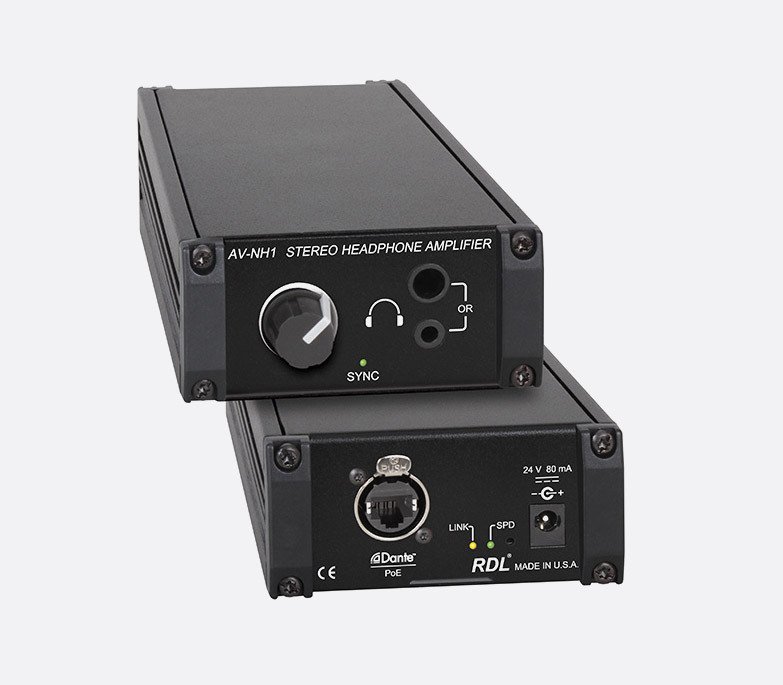 This network to stereo headphone amplifier module converts two Dante network audio signals into a single stereo analogue headphone output. The front facing panel offers both 6.35mm and 3.5mm stereo headphone outputs, both offering 100mW into 100ohms, with a rotary output volume control. The AV-NH1 can be powered from an external and optional 24Vdc power supply or via PoE. Dante sample rates of 44.1kHz, 48kHz, 88.2kHz, and 96kHz can be selected. 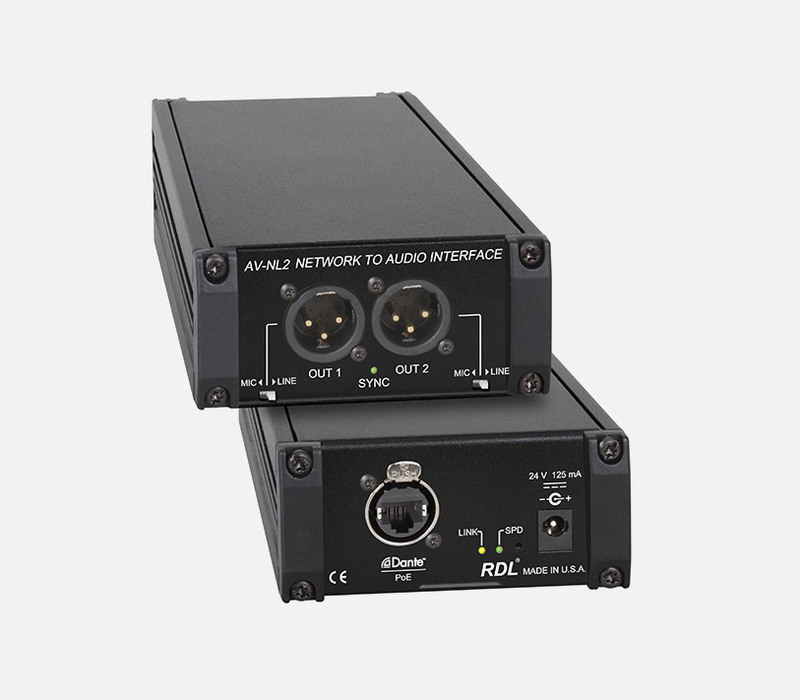 This network to audio interface converts two Dante network audio signals into two analogue balanced 3-pin XLR outputs. Switches located next to the outputs allow the user to select line level output, or attenuate by 50dB for mic level. 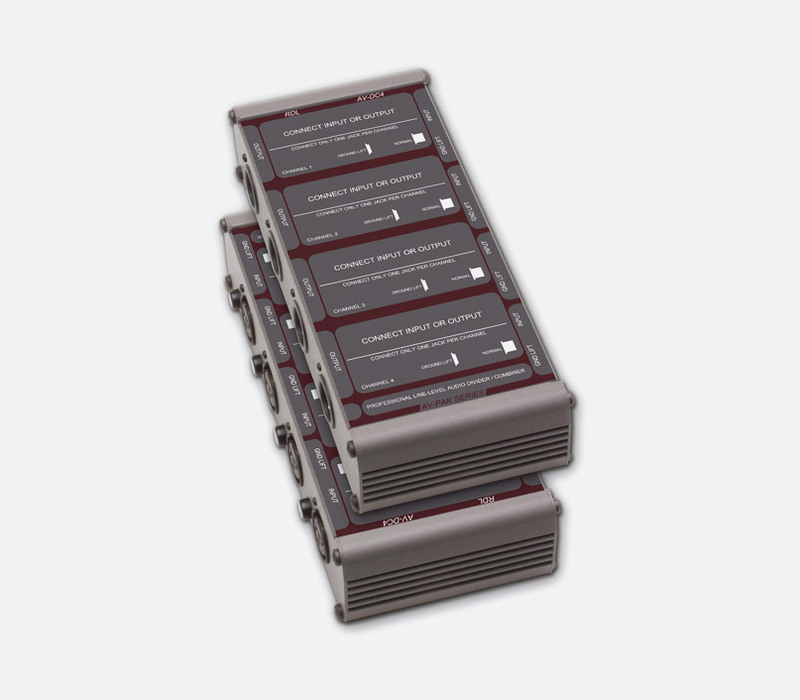 The AV-NL2 can be powered from an external and optional 24Vdc power supply or via PoE. Dante sample rates of 44.1kHz, 48kHz, 88.2kHz, and 96kHz can be selected. This interface convert up to four microphone input channels into Dante output. 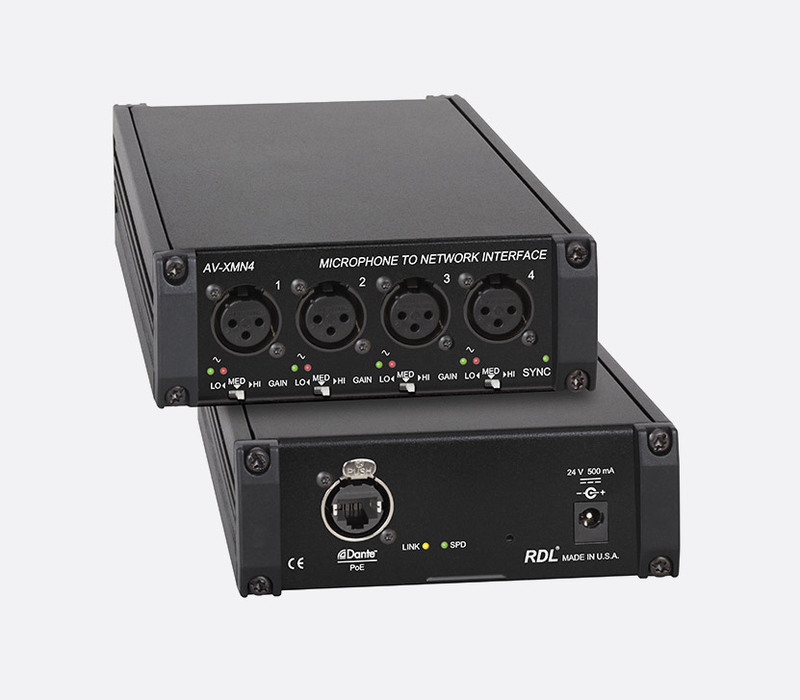 Each balanced 3-pin XLR input connection has an associated +48V phantom power, switch-selectable 40/48/62dB microphone gain, and dual-LED VU meter to monitor the input level. 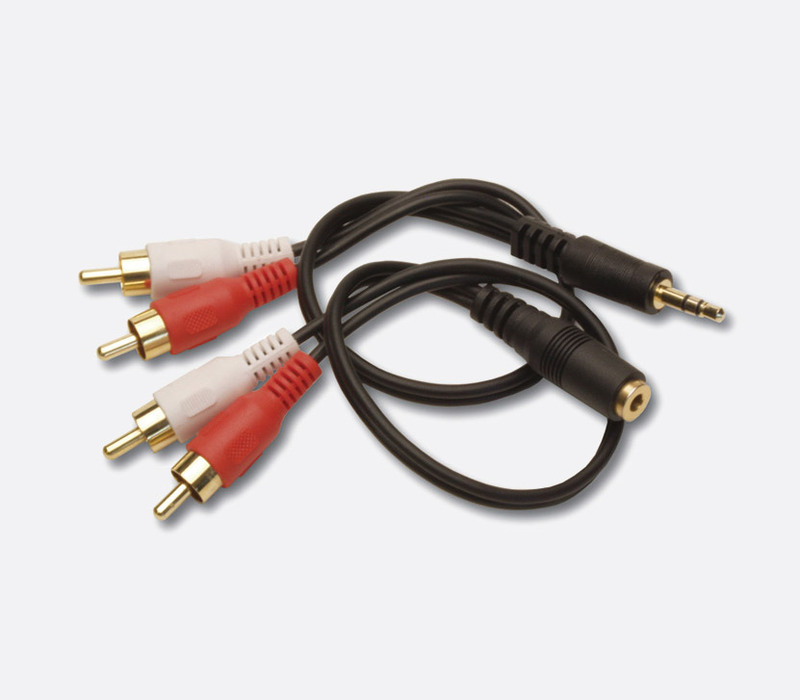 This cable kit includes a 3.5mm jack socket to dual RCA (phono) plugs, and a 3.5mm jack plug to dual RCA (phono) cable. Cable length is 20cm without connectors.